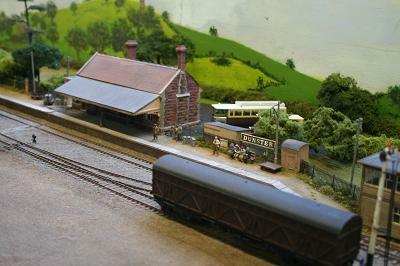 Until recently when travelling either North or East from Bristol Temple Meads you could view from the train window the English, Welsh and Scottish Railways deport of Barton Hill. This is now hidden by more recent buildings, but just a few years ago it was a Rail Express Services Depot hosting a range of red liveried postal rolling stock. 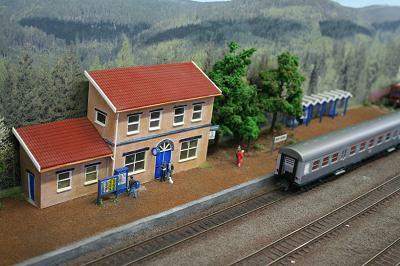 This model is intended to give an impression of that depot. Baseboard construction is of plywood, Peco track is laid on a cork base and electric point motors are a mixture of Peco and Seep. 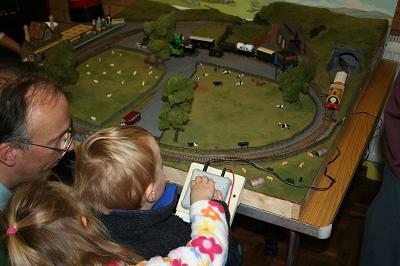 Railfreight wagons are fitted with Peco uncouplers to enable "hands off" operation by means of strategically placed electro magnets. 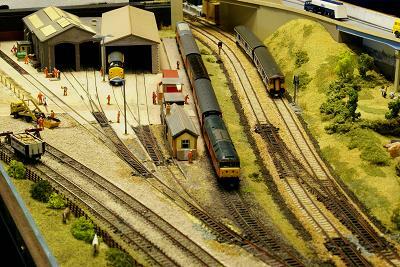 Some modelers license is used so that I can run what I like to enable me to play trains. 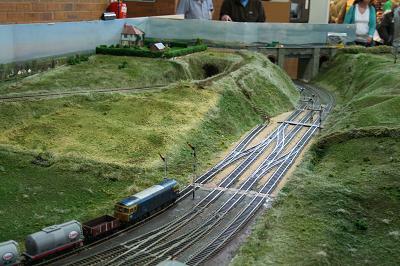 The Hull, Beverley and Scarborough Railway (HB&SR) was proposed to form a direct route between Driffield and Seamer Junction without having to use the coast route via Bridlington and Filey, or the inland route via Malton. 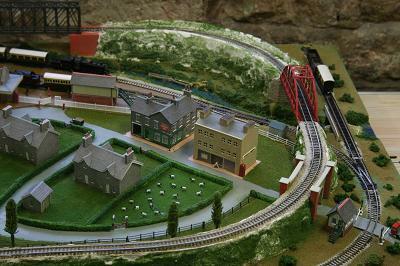 The line from Driffield to Seamer was single track and was completed in 1846 with intermediate stations at Kilham. Langtoft, Elderdyke and Foxholes. 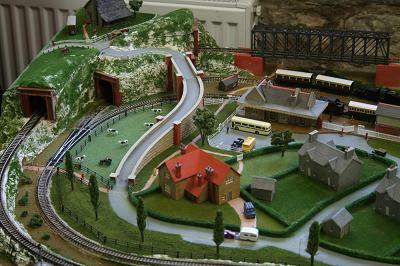 The line was absorbed into the York and North Midland Railway. which controlled lines in the Hull, Whitby and Scarborough areas until 1854 when it amalga- mated with the York, Newcastle and Berwick Railway and the Leeds Northern Railway to form the North Eastern Railway. The North Eastern Railway con- trolled most of the lines in the North East of England between the Humber and the Tweed and became part of the LNER at the grouping in 1923. At Elderdyke there was a short branch to Clogger, to capture the vegetable traffic. 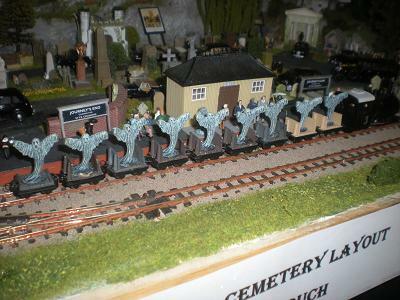 Elderdyke was not the largest village on this section of the route, so was not blessed with a passing loop, but it was the most convenient location for the Clogger branch to join the route. 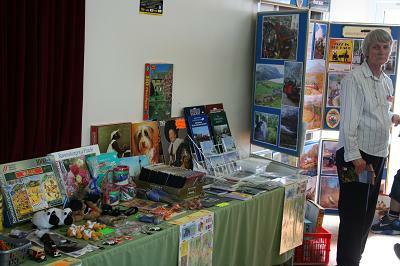 There was a siding connecting the works of Moore's printers, who had acquired the contract. During the Second World War, to print ration books for the Government This generated a good deal of van traffic to and from the works. 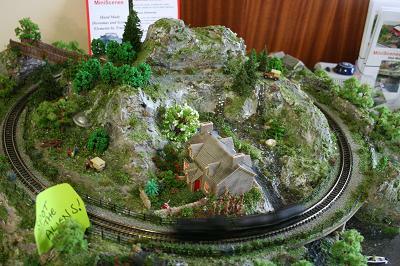 The agricultural traffic from Clogger, together with coal and general freight supported a viable goods service, but the passenger service was not well patronized. 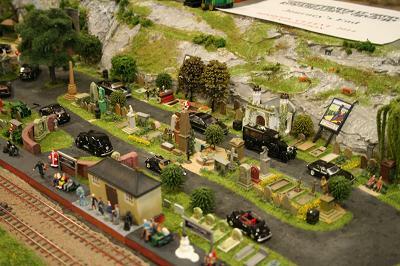 The time period for the layout is around 1946. 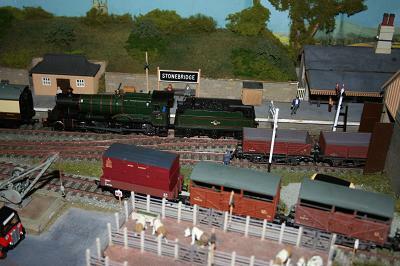 The LNER are embarked on a re-numbering scheme, so some locomotives carry old numbers and some new. Passenger trains over the HB&SR never needed to be very long, three coaches usually being sufficient to cope with passenger numbers. 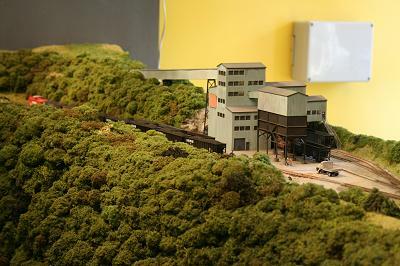 Hillside Works is a narrow gauge railway in 4mm scale, constructed using Peco 009 proprietary track. 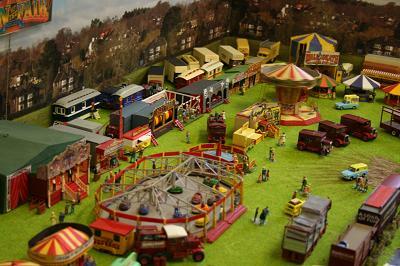 The location is set in the Welsh borders and the time period modelled is late sixties to early seventies. 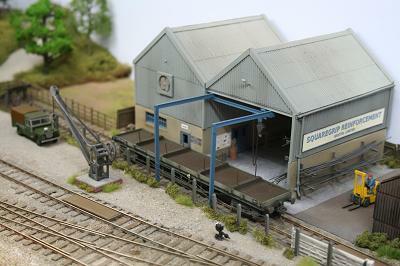 The concept and design of Hillside Works is purely fictional and an enormous amount of modeller's license has been used during all design and construction phases. 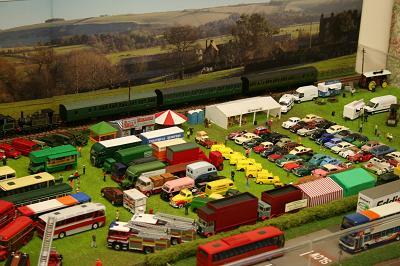 The idea was to create an easily portable layout which provides sustained operational and scenic interest for the viewing public. 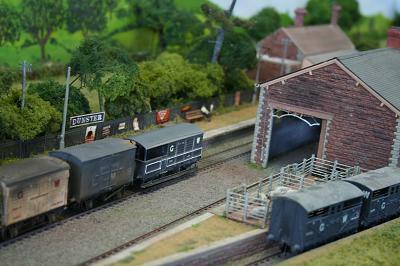 Rolling stock is a mixture of kit built and converted ready to run items mostly from RICO and Parkside Dundas. 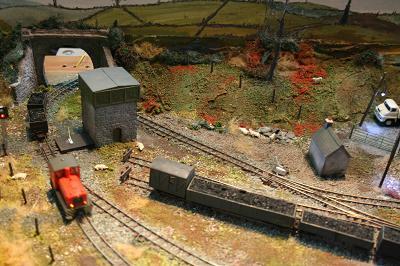 The buildings are both kit and scratch built using Ratio and Wills materials, with various scatters from the Woodland Scenics and Greenscene ranges. 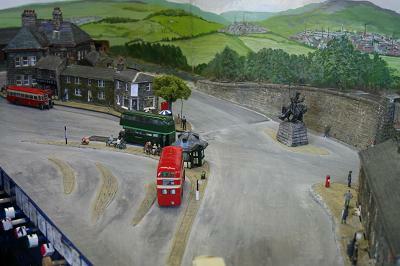 The backscene has been built and painted to represent colder autumn skies and the surrounding hillsides of a typical Welsh border area. The trees are constructed using the traditional wire frame method, which is then hand soldered and covered in a plaster mix and painted to represent the bare branches that are to be found in the late November countryside of this region. 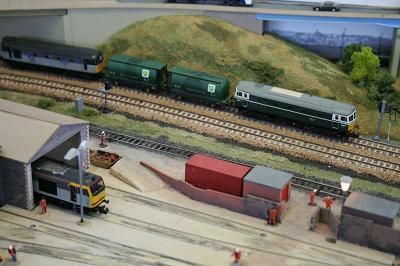 Locomotives are operated by handheld controllers using DC cab control, with AC supply derived from a 15 volt transformer which has been safely electrically isolated, another transformer supplies the capacitor discharge unit, all have been hand built. The point motors are a collection of the older SEEP type and the more modern PECO type with base mounting adaptors. 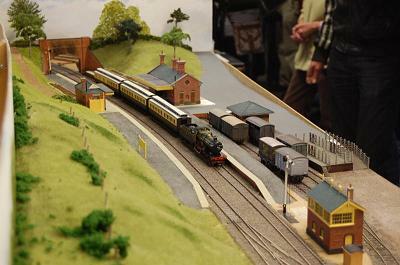 Working lamp posts and coloured light signals, together with their automatic control systems, have been specially constructed to scale for this layout from my own designs. 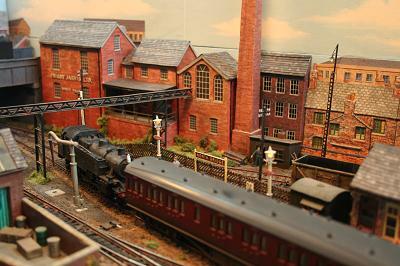 Hillside Works as with all layouts is still "work in progress". 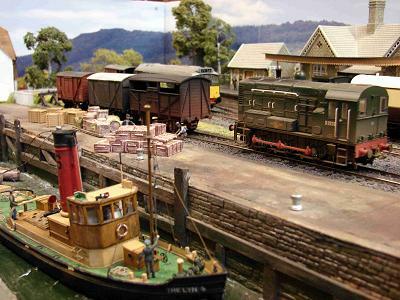 Our aim for the future is to bring it into present day by turning it into a preserved railway, called Hillside Works Heritage Centre complete with working vintage machinery, tourists and cafe. 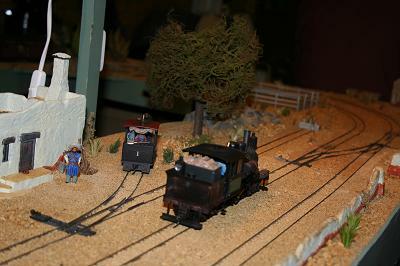 Othmar Yard is on the White Mountain Railroad just to the east of Wells River Junction in New Hampshire. 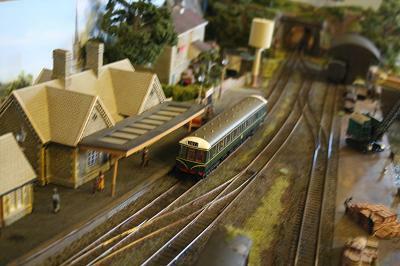 The White Mountain operates on a short length of former Boston & Maine trackage, serving a number of small industries. 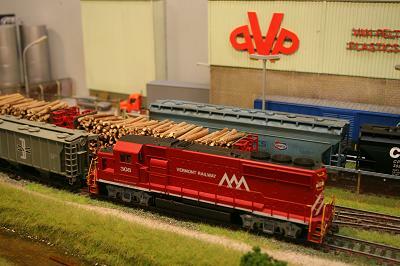 Short workings from Wells River Junction into Othmar Yard are regularly worked by Vermont Systems or Guilford System (now Pan-Am) locos, the White Mountain running the services that continue through the yard and further to the east. 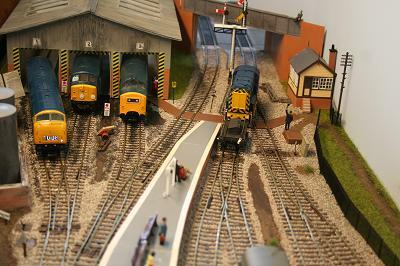 There is also a small locomotive maintenance facility here. Industries here include Gray Concrete, Schroeder Chemicals and Van Pelt Plastics. 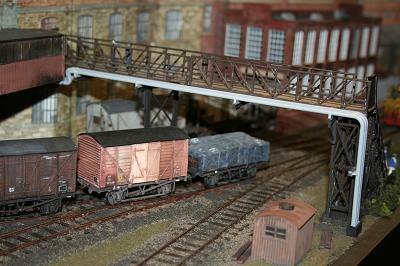 Further east (off stage) are Franklin Feedstuffs and ReRun Lumber. 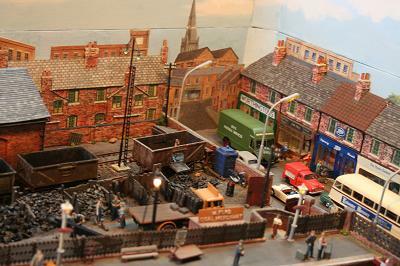 This layout was built to display an increasing amount of HO American outline stock being collected for a larger, still under construction, project. 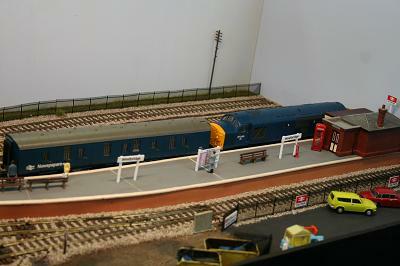 A mix of code 75 and code 100 rail is used with points modified for DCC control. 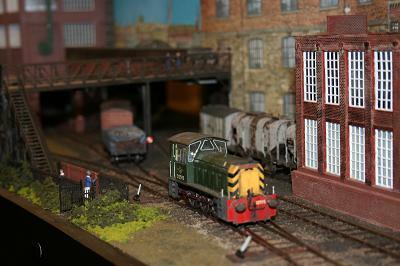 Buildings are modified Walthers Cornerstone, Pikestuff or scratchbuilt from Wills sheets. 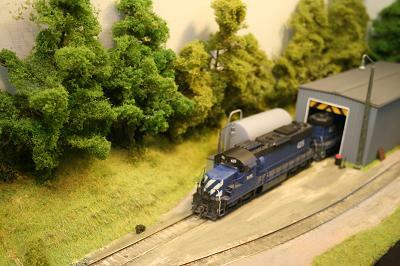 Grass is Noch Electrostatic, with trees and foliage from Woodlands Scenics. 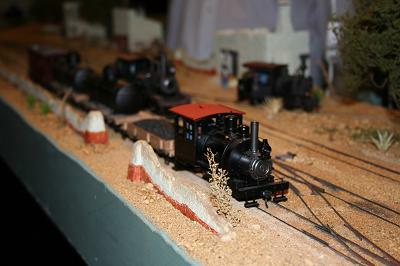 Locomotives are all Atlas 'Gold Series' with DCC sound chips. 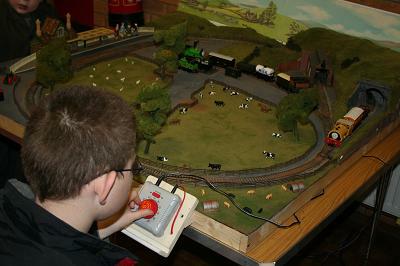 Control uses a Digitrax Super Chief system. 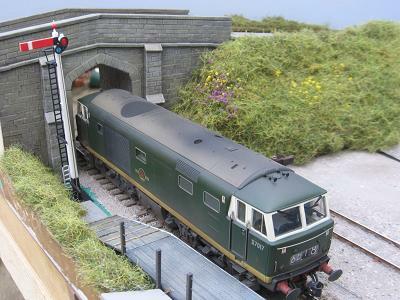 My main modelling interest is US rail roads but this project was conceived when Hattons announced their special run Class 14 diesel to be made for them by Heljan just after we had had an excellent day on the West Somerset Railway being pulled about by two of the same class of locomotive. 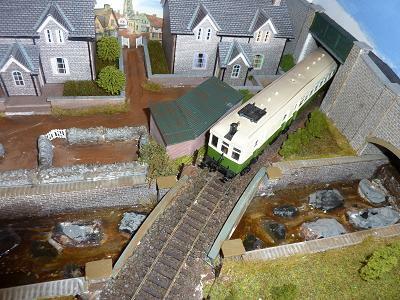 "Pixash Lane" is based near Bristol and the industries modelled are loosely based on those served by local trip workings on the main Bristol to Bath ex-GWR mainline near Keynsham. 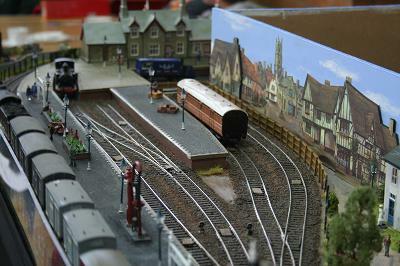 Most of the buildings are scratch-built and are assumed to be on a short branch line with a halt and occasional passenger services. 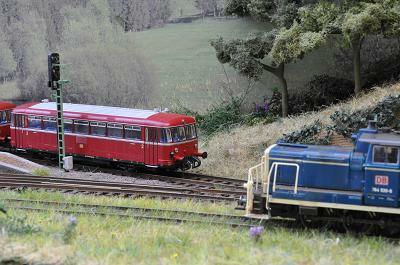 ex-SDJR line to Bath Green Park but we do allow ourselves plenty of licence. 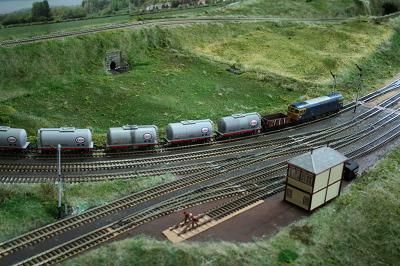 We normally operate using DCC - between us we can provide NCE, Lenz and Digitrax systems - and the stock is a mixture of ready to run and kits and is equipped with the US Kadee couplers which allows some hands off operation. 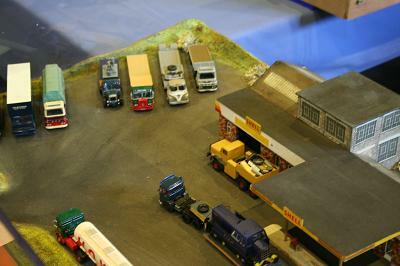 Track is a mixture of Marcway and SMP with some Peco "off-stage".